My dear angel Rosie hadn't gotten to show off her Halloween costume yet. So, obviously, she gets to debut hers on Halloween itself. Doesn't it suit her well? I have no doubt she got lots of treats at that there house. Now, this month of Halloween sure has been a spooky one. After all, we had a ghost haunting us all this month. Excuse the blurriness of the two house panthers above. Perhaps the ghost lurking about had them feeling a bit on edge. They simply couldn't keep the wiggles at bay. Ghosts aren't all that we had spooking on us this month of Halloween, though. There were also some flaming pumpkins. What's up with that? Those two up there, the cat-o'-lantern and its stitch-lipped pal, were carved and set on fire by this here human. The ones below were seen and enjoyed by this here human at a local pumpkin farm, where every Halloween hundreds of pumpkins are carved and lit for the public to enjoy. This year, 400 jack-o'-lanterns were on display at this pumpkin patch. The last one below is a bonus. He's from one of my favorite movies. Who can tell me his name, or even just the movie this little guy is from? We're wishing all of you friends of ours lots and lot of Halloween treats without a single trick! Our final Halloween tip is to use this spooky holiday as a chance to spend some quality time with your furbaby. Whether you're already staying tucked inside on Halloween night, or whether you wait until after handing out candy, do consider getting cozy and festive with your kitty or pup. For example, you can cozy up with your kitty or pup on the couch and read a spooky story, if that's your kind of thing. Another option is to of course watch a spooky movie or TV show, if that strikes your fancy. Of course, as we mentioned yesterday, do keep in mind your furbaby's sense of hearing and comfort when selecting a scary movie and volume level. For something more calm yet spookily festive, consider sitting down with your furbaby to watch It's the Great Pumpkin, Charlie Brown, or a certain famous orange tabby in Garfield's Halloween Adventure. 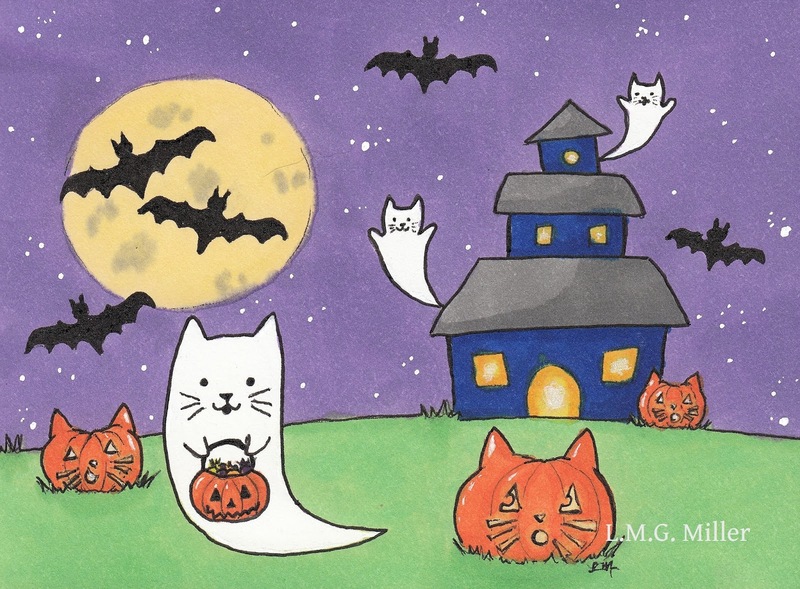 Halloween night is of course also the perfect time to not only enjoy yourself some treats (of course without sharing anything toxic for your furbaby! 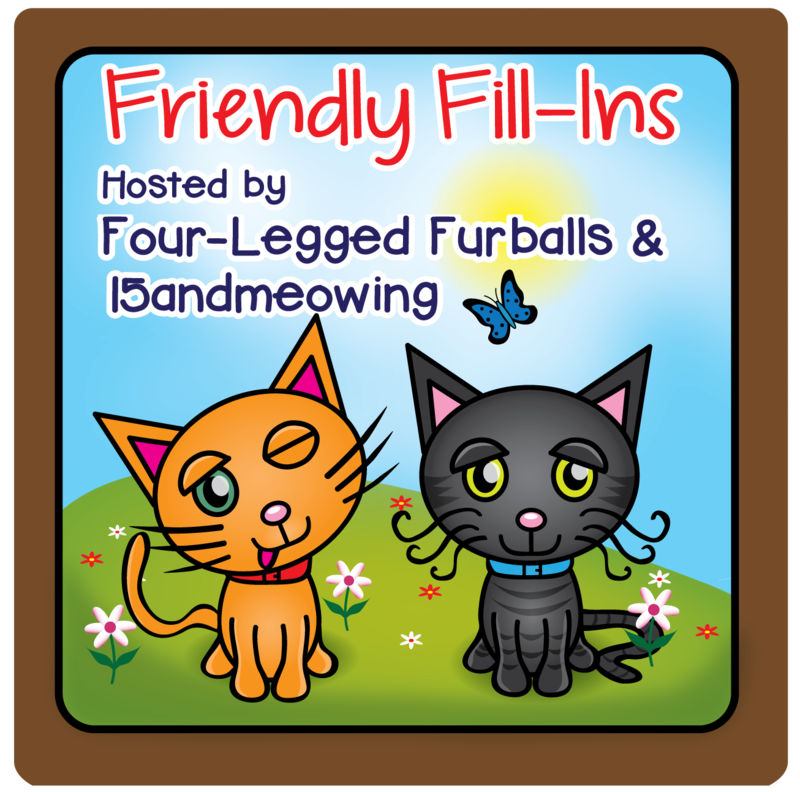 ), but to also give your kitty or pup any festive toys or treats that you got for them. Halloween may sometimes be considered a night filled with tricks and terrors, but you and your furbaby can instead use it to spend some quality time together in a festive yet safe manner. So, cuddle up on the couch and spend some cozy and festive time with that furbaby! Happy Halloween! You know that ghost who's been making its rounds in our house? The one that so far has photobombed Eddy, Thimble, and Evan? Well, don't worry. Tonks had a talk with it. Do you think the ghost listened? Do you think he'll stop haunting the furbabies around here? Have a ghostly and ghoulish day, friends! This neighbor family doesn't have any kitties or pups, the poor things, but of course I threw a black kitty into this Halloween doodle. They are actually a family who is very fond of and kind to animals, and the kids love when the other neighbor's cat visits them. The dad of the family, though, is one of the very few people I've met that has a severe allergy to cats. His wife once cuddled a friend's cat, and when she forgot about that and hugged her husband later, he had a severe reaction to the cat hair and had to seek medical treatment. That sounds like the most devastating allergy to have. Needless to say, any Halloween treat bags I give to their children are kept well out of reach of the kitties around here, and are subjected to a lint roller before being handed off to the children. If you enjoy watching horror films or other similar movies for Halloween, keep your furbaby in mind when you adjust the volume. As you all certainly know, cats and dogs have impeccable hearing. A noise that sounds normal and tolerable to us might for them sound far more loud and uncomfortable. So, take into consideration your kitty or pup's heightened sense of hearing when watching movies, especially those with loud music, screams, and so forth. If you are watching a loud movie this Halloween, or any day of the year, be sure that your kitty or pup has a quiet area of the home, away from the television, where they can retreat should they wish to. Last week, Eddy was photobombed by a ghostly little something. Yesterday, Thimble was photobombed by the same silly specter. Today's victim is Evan. Though Evan may have started out as the victim of a haunting, he proved anything but a victim soon enough. My mancat Evan is clearly a Ghostbuster. The resident Ghostbuster and all of us here are wishing each and every one of you a haunted happy Halloween week! If you think it might be fun and festive for your furbaby to get in the Halloween spirit with a chocolaty treat, consider getting them some goodies made with carob. Carob is a chocolate alternative, and it can give items such as candy and baked goods an appearance and even flavor that is similar to chocolate. What's more, carob does not contain the component found in real chocolate that is toxic to cats and dogs. There are carob pet treats on the market, and even items such as cookies for furbabies are sometimes made with carob. So, if you think your kitty or pup might enjoy some chocolaty treats of their own while you enjoy some candy on Halloween, then consider the safe and festive alternative that is carob. It's hard to snap a decent selfie this time of the year, what with all of those ghosts running rampant and haunting every shot. Thimble is not impressed by her photobomber's selfie skills, or lack thereof. We hope your Sunday is as spooktacular as Thimble's selfies! My sister, mom of our housemates Toby and Winky, wanted her black kitties to dress a tad bit magically for Halloween this year. So, they put on their pointy hats. We mentioned yesterday considering getting your kitty or pup a festive new toy as a Halloween treat and distraction, of course as long as said toy is safe for your furbaby to use. Similarly, you can typically find your furbaby some Halloween treats of the edible kind. Some companies come out with specialty holiday treats, for example. In addition, many pet stores will sell cookies, at least those for pups, and oftentimes such cookies will include those designed and decorated for certain holidays, including Halloween. You don't just have to go for store-bought goodies in order to give your kitty or pup something festive and tasty on days like Halloween, though. There are a great many treat recipes available online, including those festively made with pumpkin or those simply cut into festive shapes. I've even seen people go for simple yet effective holiday treats that merely include cutting a wedge of paté canned food into a festive shape, such as a pumpkin. Many of these options for festive treats are aimed toward aesthetics that humans rather than furbabies will appreciate, but as long as the ingredients are safe, your kitty or pup can enjoy a tasty Halloween treat just as well. So, check labels or recipe ingredients to ensure any treats you select are safe for your individual furbaby, and then let them chow down on a festive Halloween treat on Halloween night. Of course, if your furbaby has any ailments or you have any concerns about feeding your kitty or pup certain treats, do consult your veterinarian. In case any of you forgot, Halloween is coming up on Wednesday! 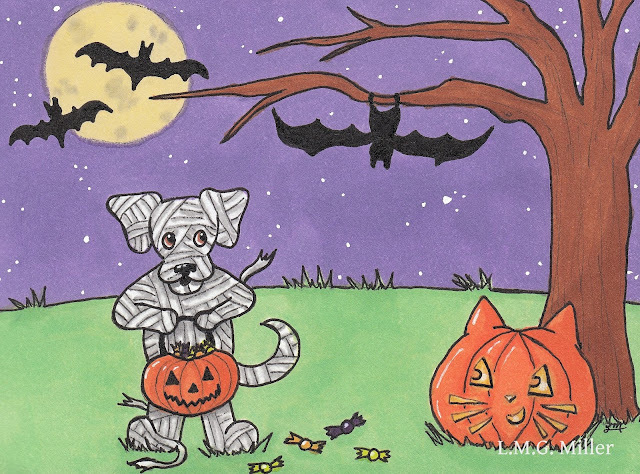 We've been sharing some doodled up versions of the resident furbabies in their Halloween costumes. Today is no different. Are you ready to see Thimble in her costume? 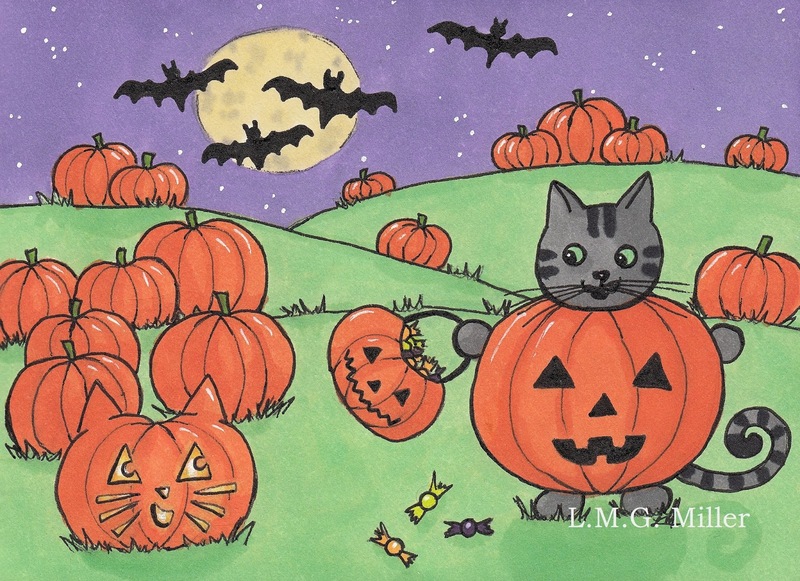 This was inspired by all of those pumpkin and jack-o'-lantern Halloween costumes for cats and dogs I've been seeing at our local pet stores. None of the furbabies here would enjoy wearing one, so I decided to make it a reality in a doodle instead. Thanks for letting me turn you into a pumpkin, Thimble! Do you want to give your furbaby an extra fun treat for Halloween? We're thinking most of you already know that pet stores typically offer festive toy options around the holidays, including Halloween. Nevertheless, we're reminding you to consider looking for the pet store's festive holiday section, or for festive options in the general toy aisle. If necessary and feasible, you can even use such festive new toys to help distract a furbaby who gets anxious or excited by the sounds and overall hustle and bustle of Halloween night festivities, such as trick-or-treaters visiting the house. Of course, if you are handing out candy, festive new toys should be given in a safe area of the home, away from the door. And, yet another caveat is to always check new toys for any potentially dangerous parts and pieces. You know your kitty or pup best, so when picking out new festive toys for them, always keep in mind their tendencies to chew on or eat certain toys. It's fun to be festive, but it's also very important to be safe. Hello and happy Friday, friends! We hope you're ready to fill in those Friendly Fill-Ins. In case you missed them yesterday, we'll share them again here. Ellen of 15andmeowing came up with the first two, and I came up with the second two. 1. _________ is an awful _________. 2. I always read _________ sections of the newspaper. 1. Helplessness is an awful feeling. 2. I always read few to no sections of the newspaper. 3. Black cats are lucky charms. 4. A purring cat is my favorite treat. 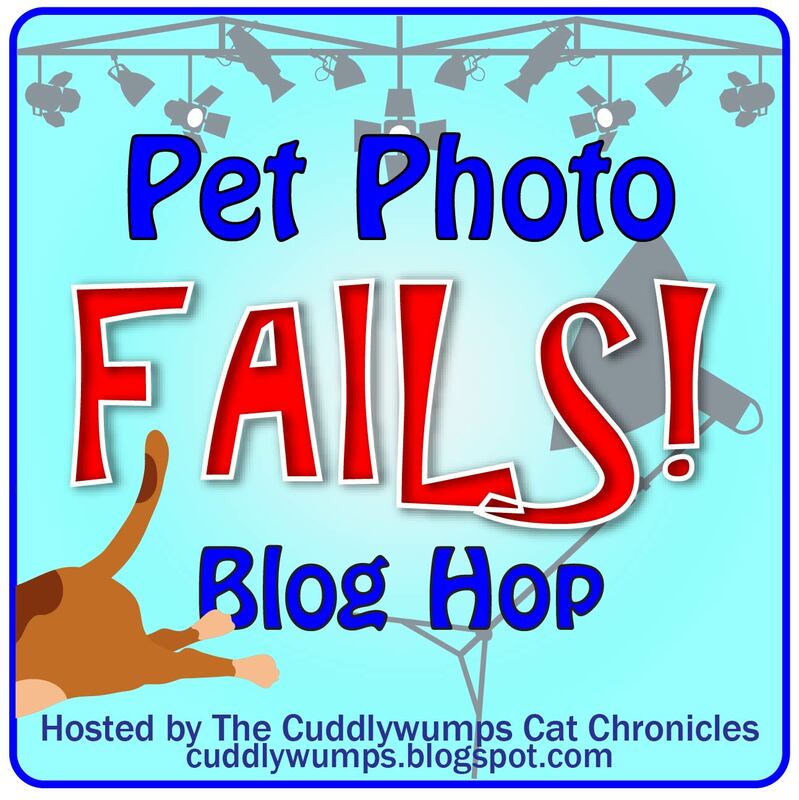 Now it's time for your Eddy fix, as well as the Pet Photo Fails! 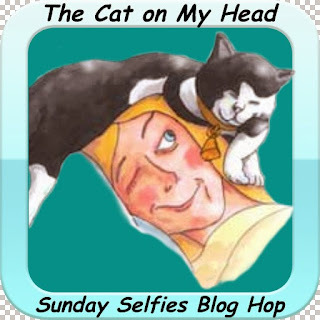 Blog Hop, hosted by The Cuddlywumps Cat Chronicles. These two go hand-in-hand, since Eddy is our resident blooper queen. Eddy's bloopers are from the same photo shoot as her selfies from this past Sunday. Remember? When she was joined by a ghost? Well, not all of the photos turned out as they were intended to. Eddy and all of us here wish you a fun Friday! Eddy and her snaggletooth fang opted to dress up as Dracula for Halloween. Today's tip in our Halloween series is one that we have given before on many different occasions. In case an unexpected escape happens on Halloween, such as if your furbaby gets out of the house when the door is opened for trick-or-treaters, be sure that they have ID on them. A collar tag and microchip with your contact information could potentially help a lost furbaby get back to you more easily and quickly. Of course, don't only make sure that your furbaby is wearing identification, but also make sure said contact info is up-to-date. If your address or phone number changes, do not hesitate to put the correct one on your kitty or pup's collar tag and to update their microchip information. No one ever wants to think about their furbaby getting loose and lost, but accidents can happen, especially on busy nights like Halloween. So, always err on the side of caution and have your furbaby identifiable in case of of an escape. Before we start our usual programming, we're going to announce the three winners of our Halloween giveaway. 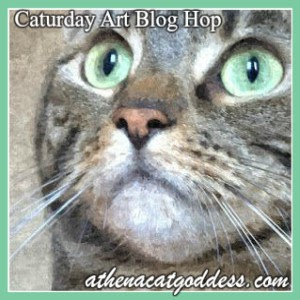 And the winners are...Eastside Cats, Linda S., and Cindy! We'll be contacting you winners today, so be on the lookout for an email from us. Now, shall we start with the Thoroughly Poetic Thursday challenge like we always do? Yes, let's do that. The ice cream shop on the corner of Full Moon and Bloodthirst. Needless to say, everyone wanted to be first. Whose dream was to some day become a chef. From soups and sushi to cookies and torte. Was to test and taste foods from all over the place. So that in the subject of ice cream he could be immersed. And Jeff finally found himself inside when the clock struck four. Right down to the shop owner's pointed hat, robe, and heels. Wait, is she dressed like a witch? Jeff asked himself. Well, it was All Hallow's Eve and she could just as well be an elf. Which looked much like the carved pumpkin that on the floor was sitting. As in, quite likely to give you a bit of a shock. Jeff's gaze scanned every item on that menu. He had certainly never seen such offerings at any other venue. And not far beneath that the Milkshake Tombstone. Which, if you were wondering, was the Eye Scream Sundae. Suddenly, beside him stood the witch. Of course, she was surely just a woman with a costume and a sales pitch. Yes, that's all she was, right? Certainly her costume was just for the sight. "What can I get for you, dear?" Was what the witch asked when she drew near. "I'd recommend the Eye Scream Sundae, if you were me. If you try it out, the reason you will see." The witch laughed and laughed and laughed. "And now puns are part of my witchcraft!" Jeff had not said a word, not even one. Not that he'd had a chance to, with the witch and her puns. It was now again the witch who spoke. "Cat got your tongue, dear? Or maybe the goat? Wait, I don't have a goat. Not even a camel! Never mind that. How would you like some samples?" The witch walked away as she chuckled. For in her hands she held ice cream creations quite absurd. As she handed him chocolate-covered ice cream topped with an eyeball. Jeff spluttered and stuttered, "Is that real?" "Oh, the eye? Goodness no, that's just for the appeal. Real eyeballs taste worse than veal." The witch said, "Go on now, a taste wouldn't hurt." Jeff knew he must taste it so that the chef's trade could be learned. Jeff found that with deliciousness the Eye Scream Sundae was busting. For it was sweeter than he could ever have wished. 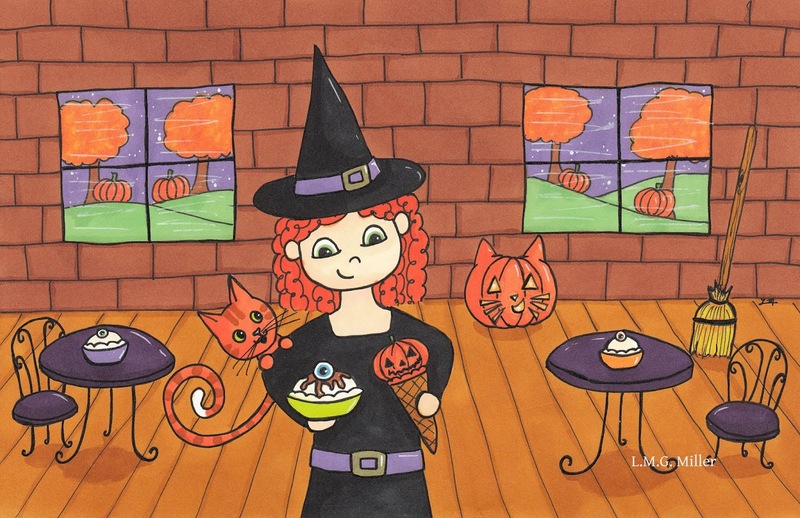 "And don't forget your Pumpkin Head Pie Cone,"
Was what the witch said as the next sample she bestowed. Except the scoop on top was in the shape of a carved pumpkin quite pristine. Yet again, Jeff was taken aback. He asked the witch how she created ice cream that tasted like that? She replied, "Food is a most complex form of magic. It can be delicious, or it can be tragic." Yet added, "But your culinary skills make you quite gifted." The witch curtsied and said, "Why thank you, dear. I could teach you the tricks of the trade in less than a year. Then the magic of it all would be to you quite clear." And that was how Jeff began working magic. That was how he learned culinary tricks he could never have imagined. Soon enough, he was making Eye Scream Sundaes all on his own. In you case you were wondering, they taste better than even a scone. Now, we didn't forget what comes next over here on Thursdays. It is now, of course, time for Thimble! 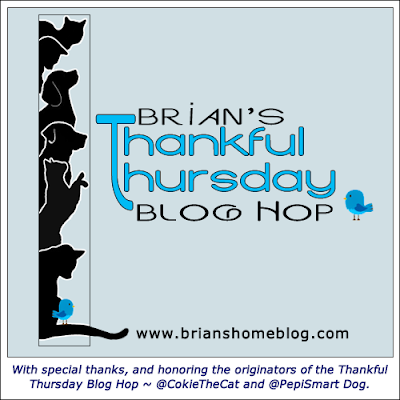 Thimble is also here to participate in Brian's Thankful Thursday Blog Hop. Today, in particular, she is grateful for her big eyes, her pretty nose, and that sunshine on her face. As we say and mean every week, we are also so very thankful for every single one of you. Thank you all for being our fantastic friends! 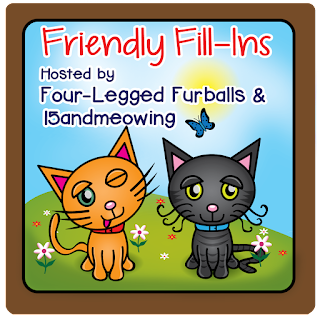 And now we have for you the fill-in statements for tomorrow's Friendly Fill-Ins challenge. Ellen of 15andmeowing came up with the first two, and I came up with the second two. We've been giving all sorts of tips related to pet safety during trick-or-treating and other Halloween festivities. And, today, we have yet another tip related to that. Then again, it is almost Halloween, so perhaps it's permitted. Today's tip is to help your kitty or pup get rid of some extra energy by engaging them in some form of activity before any Halloween festivities begin. This way, your furbaby would have less pent up energy and therefore less anxiety or frustration while they are tucked away somewhere safe while you hand out candy or celebrate this spooky holiday in another way. Helping your kitty or pup use up that extra energy of theirs could involve playing a game such as fetch with them, or directing their attention to interactive toys. If your fubaby is one who needs or likes walks, then you can also drain and prevent pent up energy by taking them for a walk prior to trick-or-treat hours. This would again enable them to release some of their energy before being secured in their safe room while you hand out candy. All in all, pent up energy can lead to issues such as anxiety or frustration in a cat or dog. This is why it might be a good idea to take your kitty or pup for a stroll, or to play with them in the house, prior to locking them up somewhere safe and away from the door on Halloween night. It's almost Halloween, and Astrid is forgoing the tricks to try out a bit of a treat as part of Chewy.com's Blogger Outreach Program. Truth be told, it's not actual treats Astrid is trying out. Instead, we opted for her try some new canned food. Though we haven't quite even reached Halloween, Astrid nevertheless tried out MerrickⓇ Grain-Free Thanksgiving Day Dinner canned dog food. We've mentioned in previous review posts how Astrid is one picky pup. Honestly, she's a pickier eater than any of cats in the house, and that is quite a feat. That being said, there is only one specific type of moist food that we have been able to get Astrid to eat consistently, without her getting tired of it. Now, though, that moist food has been discontinued. Needless to say, we've been on the hunt for a new type of moist food to feed her. We have tried literally dozens of canned dog food, and Astrid either refuses to eat it, or gets bored of it after a handful of feedings. So, here we are trying yet another canned food for Astrid. This pup is much like her kitty housemates and prefers paté food. What's more, food that is not paté often causes this pup to heave up a nice new stain on the rug. The MerrickⓇ Thanksgiving Day Dinner canned dog food is not paté, but desperate times call for desperate measures. Astrid has the most trouble keeping down canned food that consists of large, distinct, hardy chunks. In this case, though, I held onto hope, because this MerrickⓇ food is more like a stew, with softer chunks in a thick gravy. What I really like about this food is that turkey and chicken are the first ingredients, and that it also contains a good dose of vegetables and fruit. Astrid refuses to eat anything deemed "healthy" in and of itself, so if she'll eat food containing quality nutrients, then I'm one happy mom. That's why I was glad that Astrid was interested in this food right off the bat. Uh-oh. Someone else was interested, too. Once I distracted Toby with his own goodies, I gave Astrid a taste of the MerrickⓇ Thanksgiving Day Dinner food. Though I failed to get photographic evidence, guess what? Astrid loves this stuff! Guess what else? She doesn't puke it up! I didn't want to post this review until Astrid had proven to me that she would not get bored of this food. She has made it through roughly half of the 12-pack we received, having eaten it for two weeks straight now, and she still loves it. We have finally found at least one kind of food that can replace Astrid's previous favorite that has been discontinued. That has me praising this food just as much as it has Astrid scarfing it down. 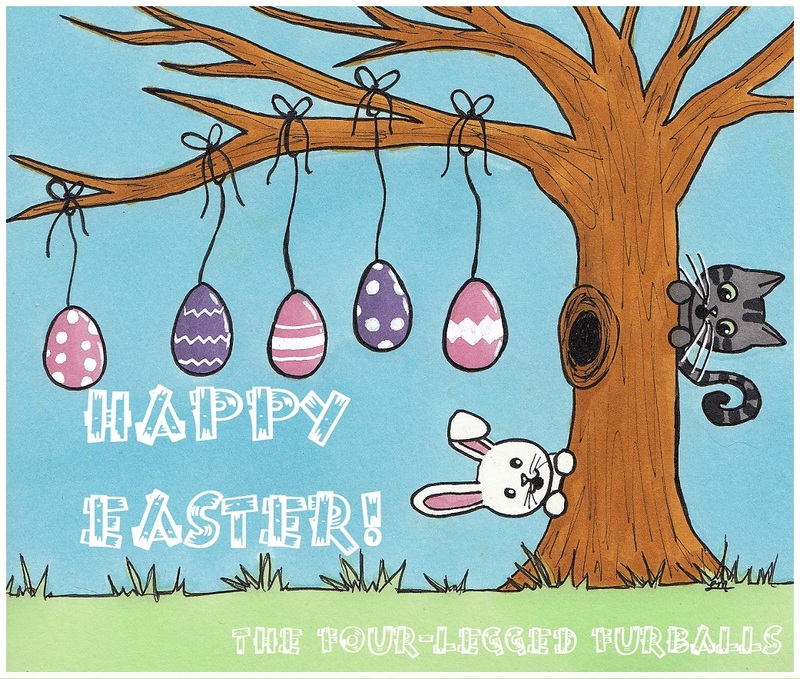 We hope all of you are having a week filled with treats! If you are interested in entering our Halloween giveaway, be sure to visit Monday's post (which you can find here) and leave a comment on that post. The giveaway ends tonight at 6 pm CDT, and the three winners will be announced tomorrow. This giveaway is approved by Toby. Astrid's all ready to trick-or-treat in her costume. She hopes that candy bucket of hers fills up fast. Today's Halloween tip is to know your local area's trick-or-treat details in order to be prepared, whether or not you are handing out candy or otherwise joining in on the festivities. Two of the important things to know are when trick-or-treat hours are, and what indicates whether trick-or-treaters should come to your door. 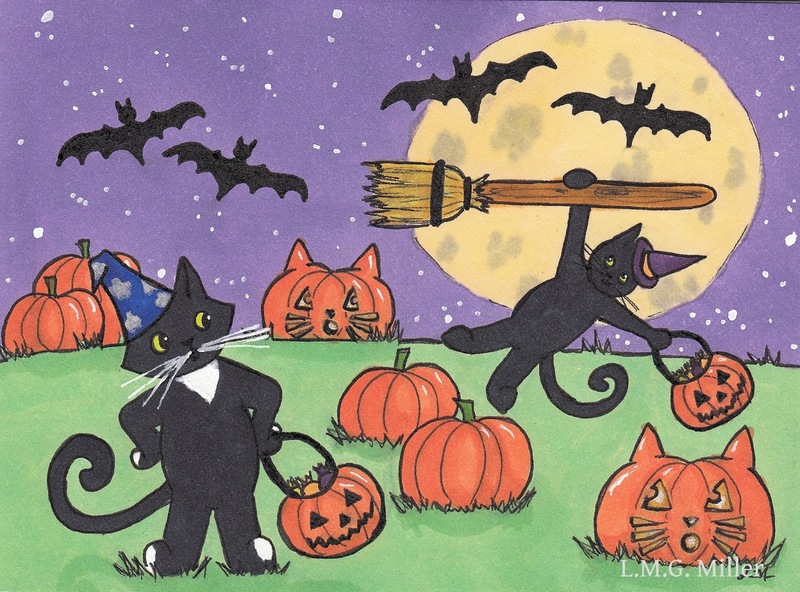 It's important to know these Halloween festivity details so that you can have your pup or kitty home from a walk before traffic increases, for example, or to have your black cats and other furbabies safely inside before people begin filling the streets in search of candy. 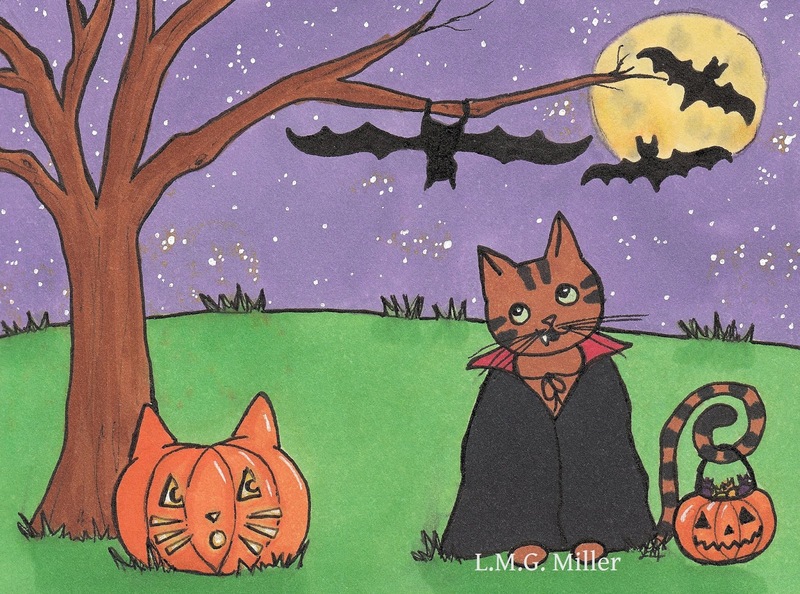 If you are handing out candy, it's good to know trick-or-treat hours so that you can have your kitty or pup tucked securely away from the door before the first trick-or-treaters arrive. 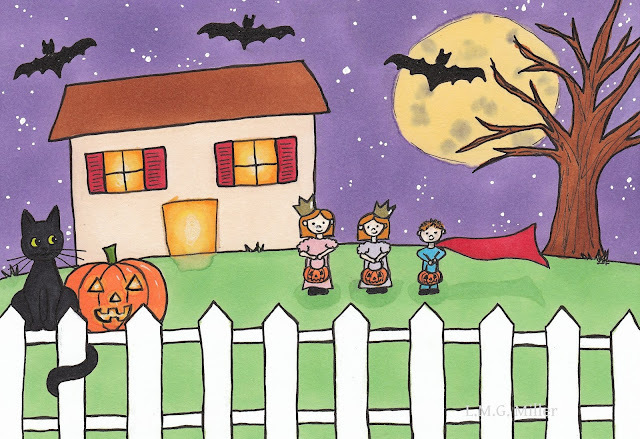 In many areas, a house with its post light on is one where trick-or-treaters can go for some loot. In the event that you're handing out candy, be sure to only have your post light on when you're furbaby is in a safe area of the home, again away from the door. If you are not handing out candy, it's of course still important to know the hours and other details of Halloween festivities in your area. This will ensure that you can have your post light off at the correct hours, in order to avoid knocks at the door or the doorbell ringing and scaring your furbaby needlessly. It's always good to be informed of the details of anything that might affect your furbaby, and that includes Halloween night festivities. Today, the felines here are going to review some treats as part of the Chewy.com Blogger Outreach Program. I don't often try out new kinds of treats for the kitties who rule my house, because they're all so picky and anything but the usual favorites usually get rejected. But, given that it's the month of Halloween, I figured it certainly wouldn't hurt to do a taste test of some new treats. It also doesn't hurt that the two newest additions, Tonks and Winky, will eat literally anything, and so now nothing goes to waste. Anyway, we'll move on to the treats. So, what did the kitties try out? They tasted tested Blue Buffalo™ Kitty Cravings™ crunchy chicken cat treats. As I mentioned above, and in about a gazillion posts in the past, the kitties around here are very picky. The general consensus around here is that treats of the chicken variety are the most likely to be eaten. Luckily, these treats come in chicken, and real chicken at that. Now, here's where things got a bit crazy. I was all worried that the cats wouldn't eat the treats. Silly me. I must have momentarily forgotten that kittens Tonks and Winky were now in the family. Blurry Tonks helped herself not only to the counter, but to the treats I was trying to photograph on said counter. Of course, her equally blurry sister, Winky, then joined in. Let's be honest, I didn't even get a chance to photograph the other cats trying out the treats. I had forgotten what it was like to have a kitten running amok, let alone two of them. It doesn't help that said two kittens have never met a treat they didn't like, and so they go in for the kill on anything that smells anything remotely like food. They sort of pushed and shoved their way into every photo I attempted. So, instead, how about a behind-the-scenes recap? Evan tasted the Blue Buffalo™ Kitty Cravings™ crunchy chicken cat treats and thought they were just okay. Housemate Toby had the same reaction. Thimble sniffed them, and that was her only opinion of them. Eddy, well, Eddy doesn't really eat anything but her one favorite kind of dry food, so I guess she doesn't really get a vote. Oh, and pup Astrid likes these cat treats, in case you were wondering. Though the big kitties in the house weren't huge fans, kittens Tonks and Winky give Blue Buffalo™ Kitty Cravings™ crunchy chicken cat treats a rave review. We hope your Tuesday is filled with tasty treats! If you'd like to enter our Halloween giveaway, be sure to comment on yesterday's blog post! You can find yesterday's blog post by clicking here. ...Evan says he approves of the goods. Not pictured are some cat toys that were too tempting to the residents, and a couple of surprise items. Evan approves of those, too. Again, just comment on yesterday's post to be in the running to win those Halloween treats (no tricks, we promise)! Yesterday's doodle revealed that Tonks is dressing up as a clown for Halloween. Now, Evan's here to reveal his costume! Do you want to know a strange and maybe sort of fun fact? For the past couple of years, when I'm in the mood to draw Evan in a costume for Halloween, I choose for him to be a ghost because that allows for easy incorporation of his paralyzed hind legs. When I say that out loud, I realize what a strange truth that is to reveal. 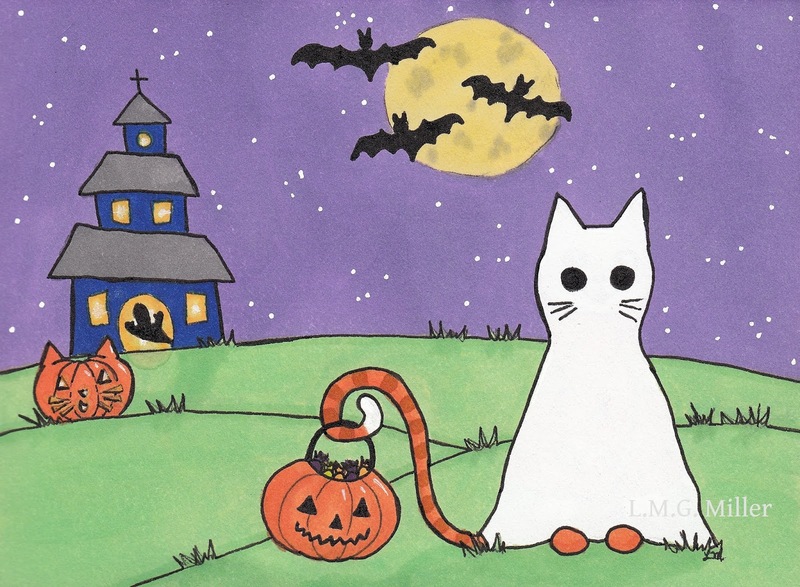 "I draw my cat as a ghost for Halloween because the doodled up blanket hides his paralyzed back legs." Well, there you go. Today's tips is another one to help keep anxious or excitable furbabies calm and safe on Halloween night. This tip involves a couple more things you can do in order to help your kitty or pup from becoming scared or agitated when trick-or-treaters are active. For example, if your cat or dog is scared or becomes excited at the sound of the doorbell, then one option is to disconnect it on Halloween night. If you hand out candy on Halloween, you can also use options such as placing the candy dish outside for trick-or-treaters to grab some loot themselves, sitting outside to hand out candy, or simply staying near the door and watching for trick-or-treaters so that they won't need to knock or ring the doorbell. As we've mentioned in previous tips, there are still ways to enjoy Halloween and its festivities while also keeping your kitty or pup as calm and safe as possible. This might mean taking some extra precautions and finding a method that works for you and your furbaby, but it is doable.